Our 1-Day Paint Protection Film (PPF) training course, or otherwise know as a "clear bra", is held on the 2nd & 4th Monday of every month (unless otherwise noted) or moreover on the Monday following our normally scheduled auto/flat/business training week; which those courses start on the 1st & 3rd Monday of every month. Keep in mind, please don't fooled by any "so-called" paint protection training schools that don't offer the valuable get-to-the-point curriculum time you need AND don't have the experience we do! But don't take our word for it...click HERE to see what our graduates had to say about us when it came to making the best choice for their training needs...just as you're doing right now! Okay, so by now you've seen all the videos or maybe have had a "quickie" demo at one of the shows, or maybe even shown a "teaser" from some sales rep that usually knows just enough about PPF installations and marketing of it to be dangerous; but now you're ready to know what the professionals don't want you to know...or in most cases, don't even know themselves. 1-Day PPF Course costs only $500*!!! 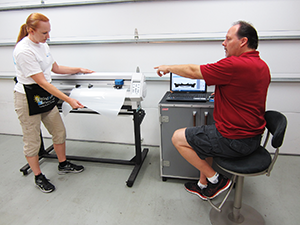 This course is 100% hands-on, and you will be taught all the tricks of the trade to not only install the top-of-the-line products with our famous hand-cutting techniques (which you never have to touch the paint), but the right state-of-the-art computer cutting machine, or other wise know as a "plotter" to make your own customized pre-cut kits and how to operate it like the pro's! Cost Avg. : Install = $500, Materials = $130, Time = 2hr., Profit = $185 per hr! Our NEW Paint Protection Film (PPF) Training; or also known as "Clear Bra"
Removal techniques & the right tool(s) for the job...Tool Kit Included! How to honor warranty claims & selling techniques to beat the competition! You will also receive our fully detailed installation instructional manual & all the marketing material to take with you to get your business up and running ASAP, along with a complete PPF Tool Kit all included!!! This is a multi-million dollar industry that can easily be added to any automotive related business with super low overhead & operating expenses; which has installers profiting up to $185 per hour, yes it's true...let us train you on how to take a slice of that pie!!! Course attendance is only 4 students maximum per session and seats are limited...so contact us TODAY to register!!! *this course cost of $500 is only for existing/past/present student(s). Or, $600 if you are a stand-alone PPF student(s) only.